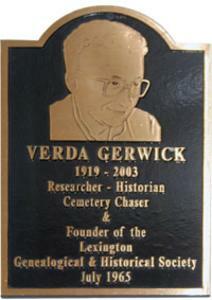 ​Verda Gerwick, founder and president of the Lexington Genealogical and Historical Society or "The Fort" as many of us know it, passed away July 19, 2003. She will be missed by all that knew her. She was a friend to many and a teacher to those just starting to do genealogy. As the story was told to me, it all started one day many years ago when Verda was attending a ladies aid society meeting. Someone wanted to know who had donated the land for the Hinthorn Cemetery. Everyone seemed to think they knew who it was and yet no one could agree as to the donator’s name, and soon an argument had broken out. So after leaving the meeting Verda decided to find out and started doing research on the subject so that at the next meeting she would be able to let everyone know. Well, as the story goes she seemed to like doing research so well that she never went back to the ladies aid meetings. She started doing research on her own ancestors and it just kept growing from there. Just ask any genealogist and they will tell you it is a contagious disease. Over time Verda was asked to help others, and in 1965 the Lexington Genealogical and Historical Society was organized, making it one of the oldest genealogical societies in the state. From what I have been told the society had meetings in the Lexington library and the basement of the old city hall building during that time. In 1979 the society purchased the building it now uses from Richard Schuler for $13,100. The down payment was made possible by the community and the society members. This two story building in the late 1800’s was the Lexington State Bank and later the T.M. Patton Insurance Building. The society moved into the building in October of that year. A fire in February 1981 destroyed the second floor and some of the records. However, thanks to the Lexington firemen and others that helped carry out materials, most of the collection was saved, and the society has been able to continue to this day. There are so many stories you tell about the great things that Verda has done. She would sit in courthouses all over the state and even other states for hours and hand write records. She and her many volunteers walked cemeteries and read gravestones, and after years were able to say that "The Fort" now has a record of all the cemeteries in McLean, Livingston Woodford, and Ford Counties. But that still wasn’t enough for Verda. She and her volunteers started looking up obituaries for all the gravestones she found. While she couldn’t say she found them all, she sure was adding to the collection. "The Fort" has a collection of indexed obituaries the likes of which I have never run across anywhere else I have been to do research. Over the years Verda has done research on the Illinois Soldiers and Sailors home. She has found graves of veterans that had no markers and ordered government markers for those soldiers and made sure that they were put on the graves. She helped many people who were adopted, find out who there parents really were, and shown some how to try and track down an adopted ancestors parents. Every so often there would be a piece in the local papers about how someone had found a tombstone. Verda then found where that person was buried. If they had no stone she made sure it was put on their grave. But Verda’s good works were not only for the dead, she would also help student that were working on history or family history papers for school. She would help 4-H, Boy Scouts and Girl Scouts with projects they were working on for a badge or award. One of Verda’s projects that she worked on and was most proud of was working with Miles Ward and the American Legion in Lexington locating veteran’s graves, and than finding out the wars in which they had served. This was so they could be recognized and on Memorial Day their graves could be decorated. Verda worked on this for some time and she would refer to them as her solider boys. A story published in the Pantagraph in May of 1973 tells how the American Legion had an honor roll called of deseased veterans that were buried in the Lexington area. There were Veterans from the Revolutionary War, Black Hawk War, War of 1812, Indian Wars, Union and Confederate soldiers of the Civil War, Mexican War, Spanish American War, World War I, World War II, Korean War and the Vietnam War. This is a heritage that we should all be proud of, as it was these Americans that helped to keep our country free. If you look up a veteran in the cemetery books at "The Fort" you will find that every person who was a veteran has a flag in the top right corner of the page to honor their service. The Lexington Genealogical and Historical Society and its volunteers would like for you all to know that they will do their best to keep up Verda Gerwick’s work and plan to keep "The Fort" open as always. Please feel free to stop in and one of the volunteers will be glad to show you around and help as much as possible.